Buriram, Thailand, – The Honda Group of Companies in Asia & Oceania reinforced their commitment to strengthen Honda’s involvement in motorcycle motorsports in the Asia & Oceania region at a media briefing following the qualifying day at the Fédération Internationale de Motocyclisme (FIM) Asia Road Racing Championship (ARRC) at Buriram International Circuit, Thailand. At the briefing, Honda was represented by Soichi Yamana, Department Manager of Motorcycle Department, Motorsports Division, Honda Motor Co., Ltd.; Mr. Atsushi Ogata, Director of Asian Honda Motor Co., Ltd.; Ryo Takahashi, General Manager of Motorcycle Business Division, Asian Honda Motor Co., Ltd.; and Makoto Tamada, Team Manager of the Honda Asia-Dream Racing. Representing Honda were Soichi Yamana, Department Manager of Motorcycle Department, Motorsports Division, Honda Motor Co., Ltd.; Mr. Atsushi Ogata, Director of Asian Honda Motor Co., Ltd.; Ryo Takahashi, General Manager of Motorcycle Business Division, Asian Honda Motor Co., Ltd.; and Makoto Tamada, Team Manager of the Honda Asia-Dream Racing. At the event, Honda confirmed it will pursue the challenges of motorcycle road racing in the region with an aim to develop world-class motorcycle riders and team mechanics from Asia. 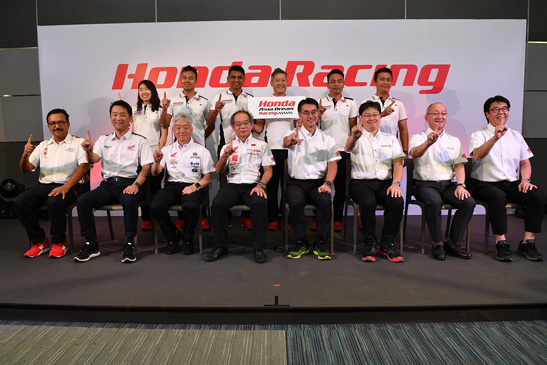 To achieve this goal, Honda is committed to creating a motorsport culture as well as developing the skills of racers and team mechanics throughout Asia. In line with this commitment, Honda’s motorcycle subsidiaries in Asia including Thailand, Indonesia, Malaysia, Vietnam, and India have been following the regional direction in their operations through a variety of motorsports activities such as establishing the Honda racing school, forming their own road racing teams, organizing local Honda one-make races, and competing in local, national, and international races. Honda’s young riders and team mechanics continue to broaden their experience and improve their skills through intensive training and by competing in various races for local and national championships. The most promising stars will move up to greater challenges by joining Honda’s racing team for international races namely the ARRC. Outstanding riders and mechanics from Honda’s Asian teams will ultimately have a chance to join Honda’s racing teams for world-class races. At the briefing, Honda also provided an update on its teams that are participating in the 2018 ARRC. Currently, Honda teams from Thailand, Indonesia, Malaysia, Vietnam, and India are competing in the Underbone 150cc (UB150), Asia Production 250cc (AP250), and Supersport 600cc (SS600) classes. They have achieved impressive results, especially in the AP250 class, in which Honda rider Rheza Danica of the Astra Honda Racing Team from Indonesia is set to take the 2018 AP250 rider championship. Honda also confirmed its participation in the inaugural Asia Superbike1000cc class (ASB1000) at the 2019 ARRC with Honda Asia-Dream Racing, a team for which top personnel from Honda subsidiaries and Honda racing teams across the Asia & Oceania region are being recruited. Former MotoGP racer Makoto Tamada was confirmed as team manager and Zaqhwan Zaidi from Malaysia as team rider. This year, the team finished in 17th place in the Japan Superbike 1000cc class (JSB1000) at the 2018 All-Japan Road Race Championship (JSB) and took 7th place in the Suzuka 8-hour Endurance Race. In 2019, Honda Asia-Dream Racing will continue to participate in both championships, challenging itself to perform better and finish in higher positions. With the collaboration of team members from Honda companies throughout the Asia & Oceania region, Honda will strive to deliver the best race results to realize the dream of having a Honda team and riders become a challenger in world-class motorcycle racing.